Bright White Clearcoat 2019 Jeep Cherokee Altitude 4WD 9-Speed 948TE Automatic 2.0L I4 DOHC ABS brakes, Compass, Electronic Stability Control, Heated door mirrors, Illuminated entry, Low tire pressure warning, Passenger door bin, Remote keyless entry, Traction control. Our Internet Sales Team is here to assist you! You may text or call us at 412-267-7978 and we are also available by chat or email. Thank you for shopping with the Ron Lewis Automotive Group! We look forward to working with you! Sale prices include all available manufacturer incentives. Please contact us for a full explanation of incentives available for this vehicle as not all customers will qualify for all incentives. Sale price does not include tax, title, and license. We make every effort to present information that is accurate. However, it is based on data provided by the vehicle manufacturer and/or other sources and therefore exact configuration, color, specifications & accessories should be used as a guide only and are not guaranteed. Under no circumstances will we be liable for any inaccuracies in price or description, claims or losses of any nature. Furthermore, inventory is subject to prior sale and prices are subject to change without notice, cannot be combined with any other offer(s), do not include provincial or local taxes, tags, registration or title fees. To ensure your complete satisfaction, please verify accuracy prior to purchase. 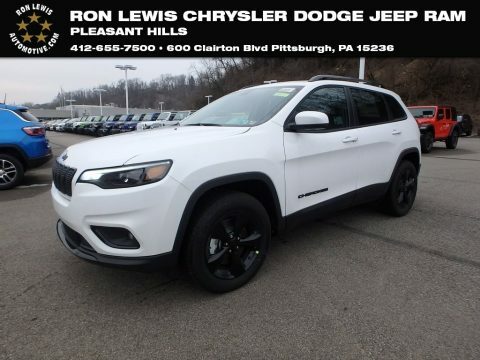 Bright White Clearcoat 2019 Jeep Cherokee Altitude 4WD 9-Speed 948TE Automatic 2.0L I4 DOHC ABS brakes, Compass, Electronic Stability Control, Heated door mirrors, Illuminated entry, Low tire pressure warning, Passenger door bin, Remote keyless entry, Traction control.